I made red quinoa tonight. One cup (washed) quinoa, one cup beef broth, one-and-a half cups of water. After cooking, I put a portion in a cup and added a pat of butter. It has a delicate nutty flavor. I'll put it together with other foods tomorrow. I want to get away from any brominated flour or bleached flour. Sadly, most store-bought bread and noodles are made with brominated and/or bleached flour these days. Isn't my quinoa pretty? J Agric Food Chem. 2016 Mar 2;64(8):1712-9. doi: 10.1021/acs.jafc.5b05761. Epub 2016 Feb 17. Bound Phenolics of Quinoa Seeds Released by Acid, Alkaline, and Enzymatic Treatments and Their Antioxidant and α-Glucosidase and Pancreatic Lipase Inhibitory Effects. Tang Y1,2, Zhang B2,3, Li X1, Chen PX2,4, Zhang H2, Liu R2, Tsao R2. Unextractable phenolics from plant foods and their role in health benefits have become increasingly important. Meal residues of three quinoa seeds free of fat and extractable phenolics were subjected to acid, alkaline, and enzymatic hydrolyses. The total and individual phenolic compounds released were analyzed, and 19 phenolics, predominantly phenolic acids and several flavonoids, were identified. The concentration of bound phenolics was highest in black quinoa followed by red and white, regardless of the hydrolysis method. Higher phenolic contents also showed stronger antioxidant activities and inhibition of α-glucosidase and pancreatic lipase activities. Carbohydrases, that is, pectinase, xylanase and feruloyl esterase, which effectively liberated bound phenolics are known to be secreted by colonic bacteria, suggesting potential antioxidant and anti-inflammatory effects by these compounds in the large intestine during colonic fermentation. These results can also be applied to treat foods high in bound phenolics to enhance bioaccessibility. I've been eating quinoa about 25 years as it is a way to minimize gluten. It took several years to get accustomed to the flavor, but now I like it a lot. 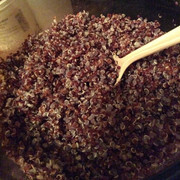 a ratio of 4 parts quinoa to 1 part buckwheat gives a perfect protein complement. Very high protein content for a grain, which is why vegetarians have made it so popular. "Quinoa (pronounced “keenwah”) is a seed that is harvested from a species of a plant called goosefoot. It is officially a seed and part of a group of pseudocereals, making it neither a cereal nor a grain, and more closely related to spinach and beets than to cereals or grains." "Buckwheat is another of the Pseudo-cereal super-seeds that are often confused with being a grain because of the grain-like way they are cooked and used. Of course, the word “wheat” in “buckwheat” also often makes people think that it is a type of wheat. Buckwheat is in fact a seed. The World’s Healthiest Foods website has a great run-down on buckwheat, including its excellent nutritional profile. Buckwheat is actually a fruit seed that is related to rhubarb and sorrel." Interesting stuff, vintage, I like it because it's simple to make and goes with just about everything - hot or cold. I don't eat it often enough. Thanks for reminding me. though I am only a little less confused. Not sure how to dissect a grain of wheat.